The southwestern corner of California is dominated by a series of fault block mountains called the Peninsular Ranges. This massive mountainous highland extends for more than 300 miles from the Santa Ana and San Jacinto Mountains of Orange County to the Sierra San Pedro Mártir in Baja California. 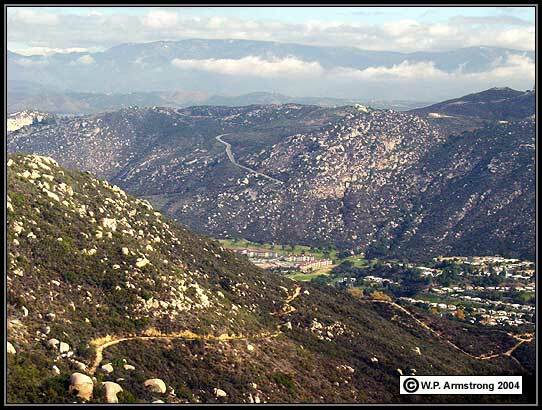 The majority of San Diego County's mountains and peaks are part of this vast mountain system, including the San Marcos Mountains. From a distance, this range looks like so many other brush-covered mountains in coastal San Diego County, surrounded by a sea of urban sprawl. The lower slopes are dotted here and there with view homes, avocado orchards and the perennial scars from land clearing. The San Marcos Mountains extend for approximately 3.5 miles (5.6 km) in a northwesterly-southeasterly direction. On the west lies the city of Vista, and to the east is North Twin Oaks Valley (named after two enormous coast live oaks) and the Merriam Mountains. The highest point along the rocky crest of the range is 1,671 feet (509 m). The San Marcos Mountains are composed of San Marcos Gabbro, a dark, basic intrusive rock that weathers into reddish Las Posas clay. 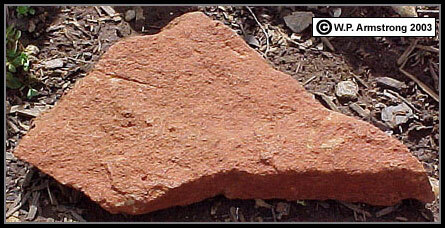 It contains a high iron and magnesium content compared with light-colored granites and granodiorites. 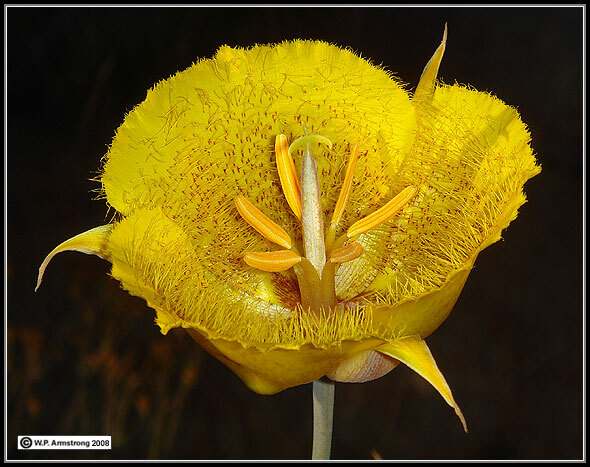 Some of the most striking (and rare) endemic plants in San Diego County occur on Las Posas soils. 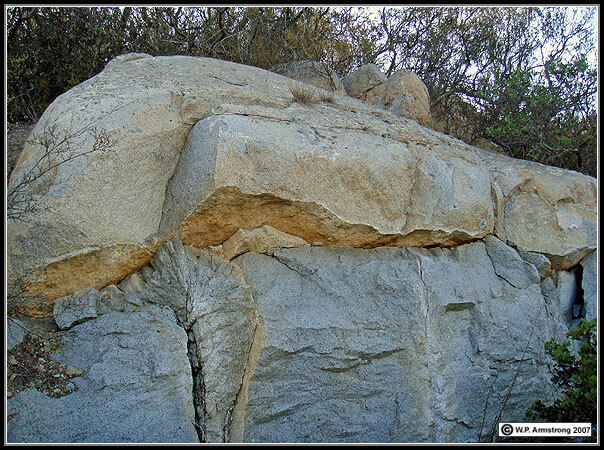 San Marcos Gabbro outcrops in north Twin Oaks Valley are excavated and used for polished counter tops and tiles. Because of its density and outstanding resistance to expansion and warping, thick gabbro table tops are used to support precision scientific instruments. In addition to a large gabbro quarry, there are several small gem mines scattered throughout the mountains where lithia-tourmaline, kunzite, smoky quartz and other semiprecious stones have been found. Two of the most famous mines were the Vista Chief (founded in 1904) and the Mountain Belle (founded in 1939). The San Marcos Mts. Looking West From The Merriam Mts. 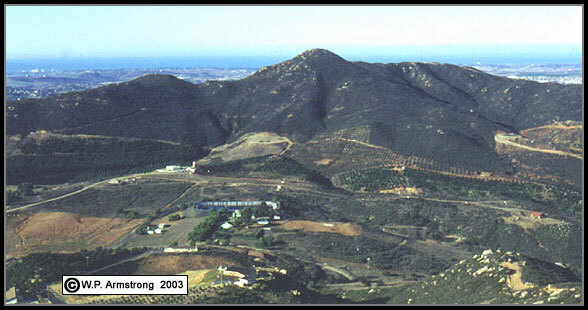 Left: A road cut in the San Marcos Mountains showing dark gabbro rock that weathers into reddish Las Posas soil. These reddish clays are the site of several endemic plant species in San Diego County. Right: The Merriam Mountains east of Twin Oaks Valley are composed of prominent boulders of exfoliating Woodson Mt. Granodiorite. 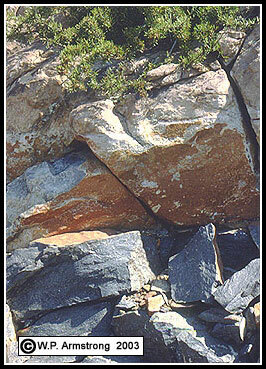 San Marcos Gabbro: A dark, igneous rock that oxidizes and weathers into reddish soils. A chip out of the left rock shows the dark crystalline structure beneath the oxidized reddish surface. It contains a high magnesium content compared with light-colored granites and granodiorites. Some of the most striking (and rare) endemic plants in the San Diego County occur on these soils. 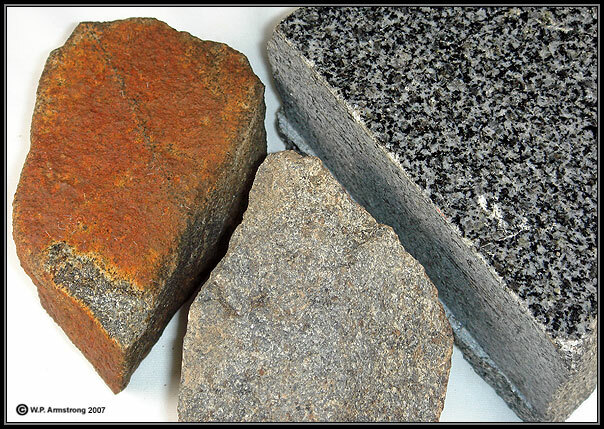 Gabbro outcrops are excavated and used for polished counter tops and tiles. Thick gabbro table tops are used to support delicate scientific instruments. 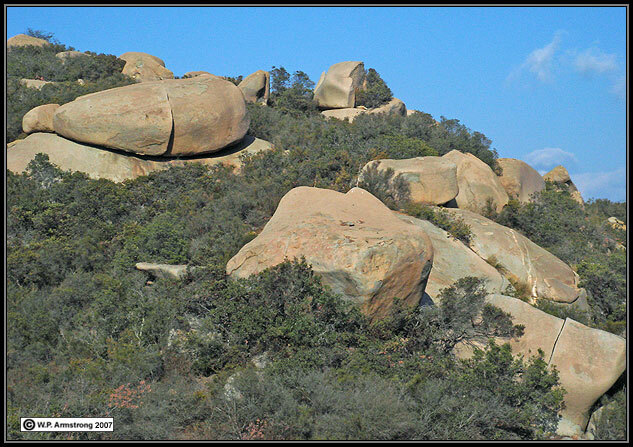 The Merriam Mountains on the east side of Twin Oaks Valley are composed of prominent boulders of exfoliating Woodson Mt. Granodiorite. 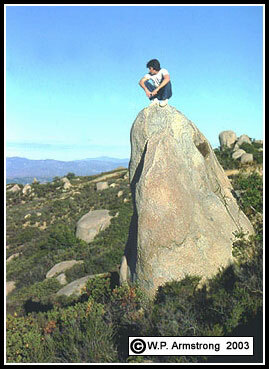 The Palomar "P" hill (Owens Peak) is composed of Santiago Peak Volcanic rock. This dark, fine-grained Jurassic age rock is very resistant to erosion and forms some of the steep roads well-known to bicyclists in San Diego County. The crest of the San Marcos Mountains looking west toward the city of Vista. 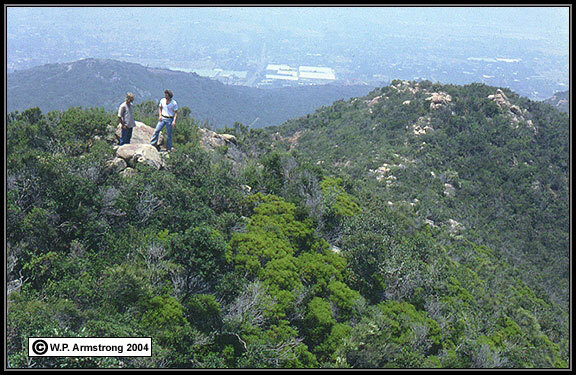 The bright green shrubs are southern mountain misery (Chamaebatia australis), a gabbro endemic in San Diego County. 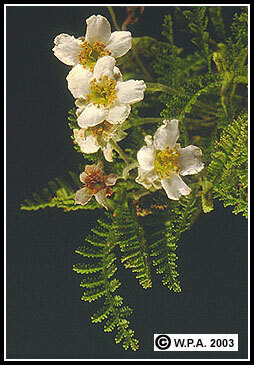 Left: Chamaebatia australis, an endemic shrub in the rose family that grows on Las Posas soils in the San Marcos Mountains. 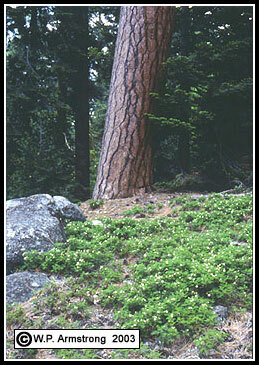 This species occurs on several isolated mountains in San Diego County, including Tecate Peak and Otay Mountain. The foliage is very resinous with the aroma of witch hazel oil. The flowers superficially resemble strawberries or black berries. Right: Another species of Chamaebatia (C. foliolosa) forms a dominant, low-growing shrub on the western slopes of the Sierra Nevada. It is called mountain misery, perhaps because of the strong-smelling resin that gets on your clothing as you hike through thickets of this shrub. The conifer in the distance is a ponderosa pine (Pinus ponderosa). Summer holly (Comarostaphylis diversifolia ssp. diversifolia), a rare shrub in the San Marcos Mountains. 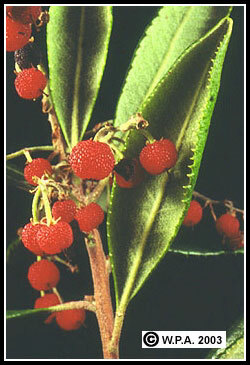 It belongs to the heath family (Ericaceae), along with manzanitas (Arctostaphylos) and madrones (Arbutus). Members of the heath family typically have urn-shaped (urceolate) flowers. 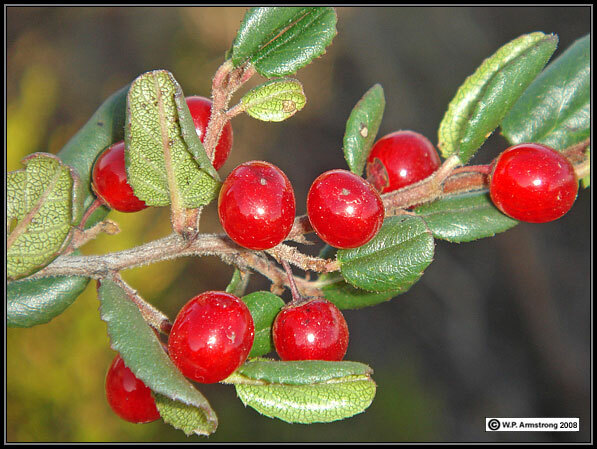 The foliage of summer holly superficially resembles the common mission manzanita (Xylococcus bicolor), although the red, bumpy fruits (drupes) of Comarostaphylis are quite different from the dark, smooth fruits of Xylococcus. Click on the following link and compare the fruits of summer holly with those of the strawberry tree (Arbutus unedo), another member of the Ericaceae. Tetracoccus dioicus (Euphorbiaceae), a dioecious shrub that typically grows on Las Posas soils in San Diego County. 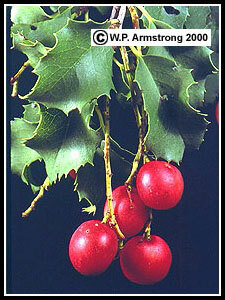 The leaves are opposite or 3-whorled with linear or narrow-oblanceolate blades. Apetalous staminate flowers occur in clusters within the leaf axils of male shrubs, each consisting of 6-10 sepals and 6-10 stamens. 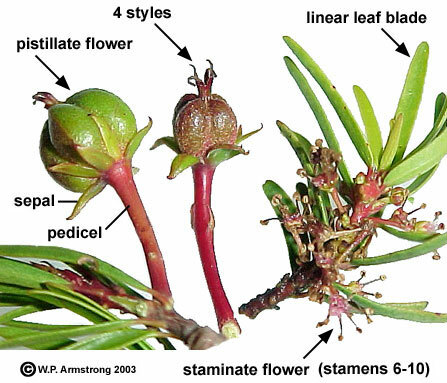 Apetalous female flowers are attached to distinct pedicels on female shrubs, each composed of a 4-chambered ovary with 4 styles and 7-13 sepals. Left: Hollyleaf cherry (Prunus ilicifolia), a native shrub in the chaparral of southern California with holly-like leaves, bright red fruits and very dense wood. The dry, seasoned wood barely floats in water with a specific gravity of 0.98. This beautiful shrub belongs to the Rosaceae. Right: Mountain mahogany (Cercocarpus minutiflorus), another native shrub in the chaparral of southern California. The one-seeded fruit (achene) has a persistent, feathery style that glistens in the sunlight. Although they usually don't travel very far, the achenes are blown into the air by strong gusts of wind during the dry, fire season of late summer and fall. This species is not related to the West Indian mahogany (Swietenia mahagoni) or the Honduran mahogany (S. macrophylla), members of the true mahogany family (Meliaceae). 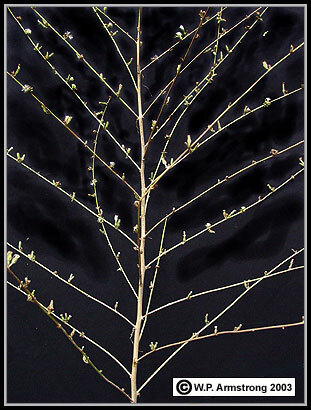 Mountain mahogany actually belongs to the rose family (Rosaceae) and produces very hard wood that sinks in water when dry (with a specific gravity greater than 1.0). The Merriam Range East Of The San Marcos Mts. Lawrence Welk Resort and Palomar Mountain in the distance, looking east from the Merriam Mts. Unlike the San Marcos Mts., the Merriam Mts are composed of large boulders of Woodson Mt. Granodiorite. Large boulders of Woodson Mt. Granodiorite in the Merriam Mts. The weathered surface of Woodson Mt. Granodiorite is lighter than the deeper layer along this road cut. Note the fractures where this dense rock splits apart (exfoliates). Left: Woodson Mt. Granodiorite from the Merriam Mts. 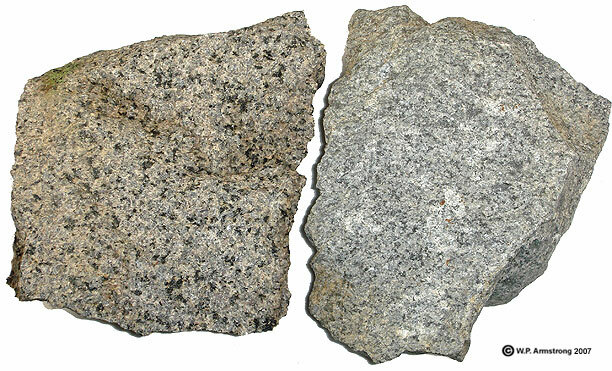 Right: Bedrock "gray granite" (tonalite) from construction site of new Palomar College Science Building. Steve Spear of Palomar College and Mike Walawender of San Diego State University (retired) recently mapped this bedrock as monzogranite (personal communication, 2007). This is a tall, glandular-aromatic annual that appears along dry, sun-baked roadsides during the hot months of summer and fall. Although it is often called a weed, it is actually a native species that competes very well with naturalized weeds in disturbed areas. This is a tall annual with a large, thick taproot. 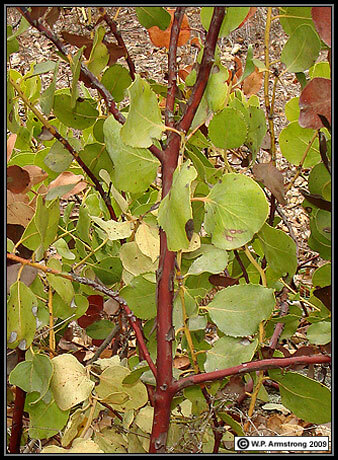 It is native to chaparral areas of San Diego County. During late spring and summer, it appears along roadsides and dry, disturbed slopes. In the hottest and driest months it grows very rapidly into a tall, upright axis with numerous ascending branches, each with solitary or clustered heads at the nodes. 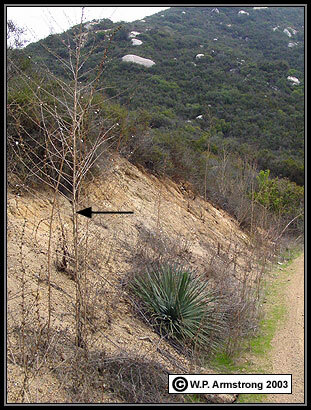 The plant in left photograph (black arrow) was photographed in December, 2003 along a dirt road in the Merriam Mountains of northern San Diego County. It was about 8 feet (2.4 m) in height and still had many heads with flowers in bloom. The heads of this species are ligulate (strap-shaped) and without tubular disk flowers. They are sessile or on short peduncles. 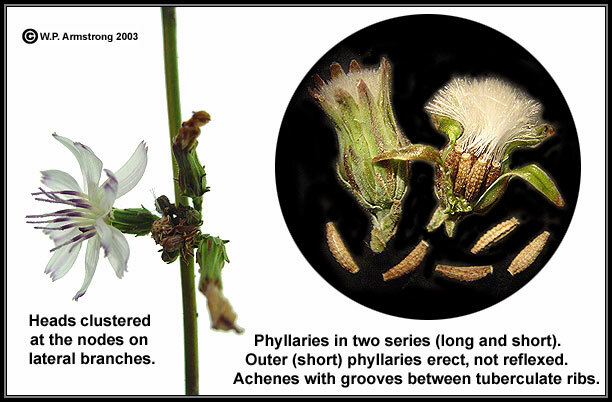 The phyllaries are in two distinct sets, the inner (longer) and outer (shorter). The outer, shorter phyllaries are erect and appressed, not reflexed. In addition, the phyllaries are not glandular as in other species. Each head contains up to 12 achenes representing 12 separate flowers. The achenes are longitudinally ribbed with rows of minute tubercles, and with a narrow groove (crack) between the tuberculate ribs. In the Jepson Manual of California Plants, if one interprets the groove as only a valley between the tuberculate ribs, this species would key out to S. virgata ssp. pleurocarpa. 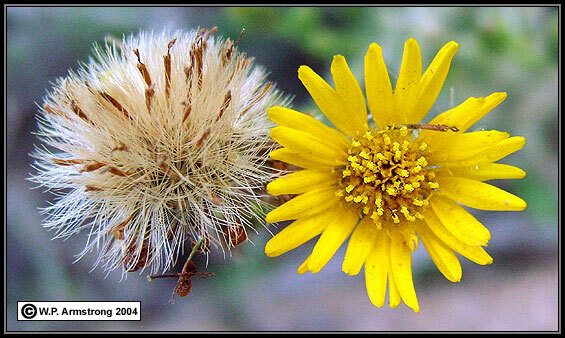 The two species are very similar overall, and many specimens of S. diegensis have been misclassified as S. virgata. Left: Stephanomeria diegensis. The minute one-seeded fruits (achenes) are about 3 mm in length. Each achene has a narrow longitudinal groove (crack) down the center of one or more sides. 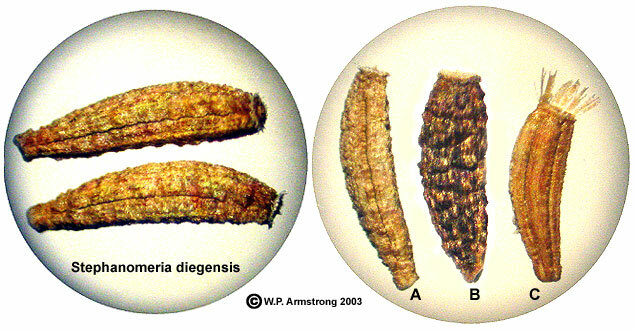 Right: Achenes from three species of Stephanomeria in southern California. A. S. diegensis. B. S. virgata ssp. pleurocarpa. The achenes are tuberculate-ribbed without a groove between the ribs. C. S. exigua ssp. deanei. The 5-sided (angular) achenes have a distinct longitudinal groove on each side. They also have a persistent pappus base at the apical end. Left: A seed head composed of 12 achenes, each with a pappus of hairs resembling a parachute. Individual hairs are plumose at their upper ends with numerous branched hairs. 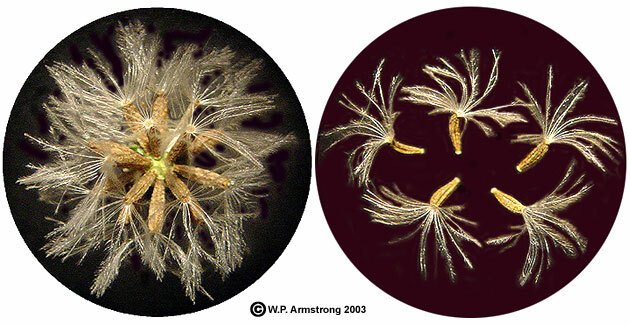 Right: Like miniature parachutes the achenes become airborne with the slightest gust of wind. Airborne achenes such as these have enabled species in this remarkable family to cross prominent barriers of land and sea to colonize new habitats. With 12 seeds per head, and many hundreds of heads during its long blooming season, there is a good possibility that some airborne achenes of this annual will land in a suitable spot for the next season's crop. Liliaceae: Weed's Mariposa (Calochortus weedii var. weedii). 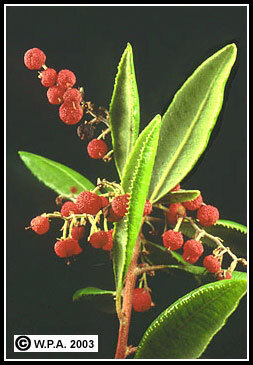 Rhamnaceae: Hollyleaf Redberry (Rhamnus ilicifolia). 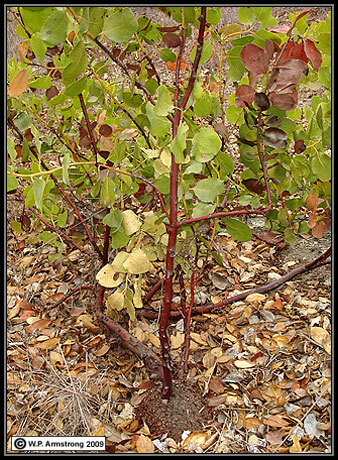 Rainbow manzanita (Arctostaphylos rainbowensis) occurs in the southern Merriam Mountains. It has non-glandular foliage and spherical lignotubers. This rare species is named after the community of Rainbow. Mountains." Environment Southwest No. 493: 3-7 (Spring 1981).